Cheapest Flights and Hotels with Excellent holiday travel packages & Tour packages. Best Travel Agency In Himachal..
Shimla is India’s finest hill station, a popular honeymoon destination and also perfectly suitable for a family vacation. It is unbeatably one of the places that you cannot be missing on if you are planning a North India holiday tour. This tastefully crafted Shimla Kaza Spiti holiday tour package will let you explore the rejuvenating Himalayan hills and nature along with her colonial charms. This capital city of Himachal Pradesh is endowed with natural scenic surroundings that offer a spell bounded view from almost all places within. On this Shimla Kaza Spiti holiday package, you can experience sight-seeing and shopping at Shimla’s enchanting mall road along with excursions to close by pastoral paradise of Spiti and Kaza. Spiti is one of the most picturesque valleys in India and Kaza is popular with travellers and adventure junkies. The itinerary consists of visiting ancient monasteries, exciting Himalayan drives and rushing the adrenaline with some adventure activities. Holiday Travel India designed this combo package to explore not only Shimla but also take you to Spiti Valley, Kaza, Sangla Valley and many more unique destinations of Himachal. In this package we will take you to explore highest Motor able village in the world, world’s highest motor able monasteries, Chandratal Lake & Pin Valley National Park near Spiti. In this package you will also explore Sangla Valley which is known for Adventure activities, Camping, Trekking and many more. At last you will cover Shimla with Kufri and Naldera which make this package very special and unique from other Himachal Packages. Personal expenses like shopping, laundry, telephone, tips, etc. Once you step on the land of snow and hills, take a 4 hour drive (250 kms) to reach Sangla. Set on forested sloped that provide breath taking views of the high mountains, it makes a perfect getaway from the swarming cities. There are several popular attractions in Sangla, right from fort to temples to nearby villages making it a beautiful holiday destination. Once you have checked in and had lunch, visit the Tibetan Wood carving centre. It is a paradise for shopaholics. This place is famous for unique and artistic Tibetan products made of wood carvings. After breakfast, head out to visit the popular places to visit when in Sangla- Sangla Meadows, Chitkul Village and Kamru Fort. Sangla Meadows is a very famous sightseeing place in Sangla known for its panoramic landscape and snow covered mountains. It makes a flawless site to see the Kinner Kailash mountain ranges with a 180 degree view. Chitkul Village sits on the banks of River Bapsa. This place blooms with excruciating scenic beauty and you can buy the supposedly best in the world and very famous potatoes of this village. Kamru Fort is one of the oldest forts in Himachal Pradesh. It is now converted into a temple that is dedicated to the Hindu Goddess - Kamakhya Devi. Standing on a pedestal of stones, the fort flaunts its elegant wooden balcony with pride. Sangla Meadows: Sangla Meadows also known as Sangla Kanda is another very popular sightseeing attraction nearby Sangla, which is known for its natural views and snow-covered mountain ranges. Sangla Meadows additionally makes for a flawless site to see the Kinner Kailash mountain range with a 180 degree view. This place remains covered with lush greenery and is bounded by snow capped hills of the majestic Himalayas. Chitkul Villages: Chitkul is the last inhabited village situated near Indo-Tibet border at a distance of 20 km from Sangla. This village lies on the right bank of River Baspa. The most popular attraction of this village is the temple of local goddess ‘Chitkul Maathi’ also known as ‘Mata Devi’. People of the entire Kinnaur District come to worship at this temple. Chitkul also experiences heavy snowfall during winters, due to which it also becomes completely un-inhabited. Kamru Fort: Kamru Fort is one of the oldest Forts in Himachal which is located in Kinnaur District of Himachal Pradesh. The Kamru fort is a quiet sentinel, located at a fearsome altitude of 2,600 m above the sea level. This place is at a distance of 57-km from Kalpa and 229-km from Shimla. The fort is one grand sight amidst snow-laden mountains, thick deodar forests and lush-green, fruited orchards. Standing on a pedestal of stones, the Kamru Fort flaunts its elegant wooden balcony with pride. Bering Nag Temple: The Bering Nag Temple is another popular nearby temple and religious sightseeing destination of Sangla. This temple is dedicated to God Jagas. Its most popular feature is the Fulaich Fair, held here every year between the months of August and September. Post breakfast, explore some more excursions in Sangla Valley. Today, take a trek and explore Rubin Pass and Glacier watch. With every step, the Rubin pass route throws up a new scenery to unfold. The blue waters of the Rupin run along complementing the lush greenery. Right from hanging villages to glacial meadows and terrific forests to a hundreds of water falls, the Rupin Pass trek covers it all. The glacier is a new vista to see. You can walk a few kms. around the camp to a glacier. It is among top in the list of places to visit in Sangla Valley hill station. Later if time permits, visit the Bering Nag Temple. It is another famous religious sightseeing place in Sangla. Dedicated to God Jagas, try and catch the Fulaich Fair held every year here between August to September. Rupin Pass: Rupin Pass is a high altitude pass across the Himalaya mountain range in state of Himachal Pradesh, India. It lies on a traditional shepherd and hiking route which starts from Dhaula in Uttarakhand and ends in Sangla in Himachal Pradesh. It is made for the adventurous nature lovers who are keen to explore a remote Himalayan valley. This fascinating trekking brings all the classical attractions to hold the ascending gentle trails. The trek will also carry the adventurers around the three valleys namely Rupin, Baspa & Pin to catch the meadow campsites with each having a great feature of their own. Glacier Watch: Tourists can walk a couple of kms around the camps to a Glacier. Glaciers eventually melt away by May end or early June. It is among top in the list of places to visit in Sangla valley hill station. After sightseeing you may have lunch at any nearest Restaurants, later you will visit Baspa River and catch vast variety of fishes. Baspa River: The Baspa River is a fast flowing river that passes though the hills of Sangla. The surroundings of Baspa River provide an opportunity to view timely rainbows and brown trout. It is also an angler’s paradise for being home to a vast variety of fishes. Crossing this river is also quite an attraction amongst the visitors as this process involves ride in a basket along the way. Its surrounding areas also stand appropriate for campers and trekkers. Post breakfast, check out and proceed towards Kaza. Located high up in the mountains of Lahaul and Spiti Valley, you cover a distance of 230 kms by drive. It offers spectacular views of snow-capped mountains and crystal clear rivers. Once you check in, head out to see the Komic village. Visit the world’s highest motor-able monastery, also known as the Tnagyud Monastery that overlooks the Komic village and mountain peaks. It is situated at an altitude of 5150 m above the sea level. The place has been blessed by lush surroundings, unspoilt scenery, barren landscapes and snow-covered peaks. It is a must visit place in Spiti Valley. Spend an afternoon sitting and relaxing on this hill and witness the mesmerising sunset. Later, return back to the hotel for a peaceful sleep. Once you’ve had your breakfast, explore the very famous attractions of Kaza that include Chandratal Lake and Kibber. Chandratal means the “Moon Lake” derived from its moon like shape. A night in the camps at Chandratal’s banks is one of the key highlights of a journey to Spiti valley. For anyone who loves star gazing, this is a perfect spot to do so. Kibber is the reason that Spiti Valley is also known as The Little Tibet. The stunning and pollution free atmosphere and high altitude of Kibber is a boon for photographers and sky gazers. Return to the hotel for a good night’s sleep. Ki Monastery: Kye Gompa monastery located on top of a hill at an altitude of 4,166 meters (13,668 ft) above sea level, close to the Spiti River, in the Spiti Valley of Himachal Pradesh. Key Monastery is over 1000-year-old. It is the oldest training centre for Lamas. It is a collection of rooms and a labyrinth of corridors that do not follow any defined plan, but seem to have grown over the years. No definite data can be ascribed to the construction of the gompa that acted both as a monastery and as a fort, in the architectural definitions given to various monasteries. Chandratal Lake: Chandratal Lake is a high altitude lake located in Lahaul & Spiti region of Himachal Pradesh. At an altitude of 4,300 meters, this lake is the source of Chandra River and its name “Chandra” is believed to be derived from its moon like shape. Lake is also quite famous for its majestic reflections of surrounding Himalayan peaks in its deep blue waters, which once you witness, will never forget in you entire life. Kibber: Kibber which is located in Spiti Valley and at a height of 4205 meters above sea level holds the distinction of being the highest Motor able village in the world. The landscape of Kibber is similar to that of Ladakh and Tibet and the Tibetan Buddhism is the predominant religion here. This is the reason the Spiti Valley is also known as Little Tibet. The high altitude and stunning & pollution free atmosphere of Kibber is a boon for sky gazers and photographers, who get the most amazing pictures of the natural wonders here. High altitude and pollution free surroundings make Kibber a great destination for sky gazers as well as nature and adventure lovers. Watching the night sky from Kibber is indeed one of the best experiences in India. After that you may have lunch at any nearest restaurant, after that you will continue your tour by visit Komic Village of Kaza. Komic Village: Komic Village is lesser known village of Himachal Pradesh. Komic monastery also known as the Tnagyud Monastery has the honor of being one of the world’s highest motor able monasteries at 4587 mts overlooking the Komic village and mountain peaks. Komic in Spiti Valley is placed at an altitude of 5150 m above the sea level. The village has around a dozen houses, one monastery and a population of around 150, including the monks. After a healthy breakfast, move ahead to see the other famous places in Spiti Valley- Key Monastery, Pin Valley and Kunzum Pass. 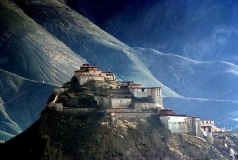 Key monastery is exceptionally beautiful and is positioned on a picturesque hilltop. It is very close to the Spiti River and is at least a thousand year old. It still houses ancient Buddhist paintings and scrolls. Pin Valley is the only cold desert National Park in Himachal Pradesh. It is home to more than 20 species of birds and animals including the endangered Snow Leopard. Enjoy the place’s natural beauty and exquisite wildlife. Kunzum La offers a phenomenal 360-degree view of the second longest glacier in the world- The Bara- Shigri Glacier. You can also witness a spectacular view of the Spiti valley and a jaw-dropping vista of Chandrabhaga Range. This incredible view makes the Pass a photographer's dream. The Pass is an astounding mixture of three different landscapes; the turquoise river of Spiti, the dry barren mountains and massive glaciers of Lahaul. Kunzum Pass: Kunzum Pass is a high mountain pass on the eastern Kunzum Range of the Himalayas some 122 km (76 mi) from Manali. It connects the Kullu Valley and Lahaul Valley with the Spiti Valley of Himachal Pradesh. The pass connects the Kullu and Lahaul Valley with the Spiti Valley. It can be reached from Kaza. The valley top offers a picturesque landscape with stunning view of the Chandra Bhaga ranges that surrounds it on the north sides with snow clapped peaks. Chandratal Lake is 7 km from Kunzum pass. Kunzum Pass that is called as Kunzum La in Chinese. It stands at the elevation of 4,590 m. The distance is at around 122 km from Manali. Dhankar Lake: Dhankar Lake is situated above the Village of Dhankar at the height of 4136 meters (13570 feet) in the middle of hills. Dhankar Lake Trek in Spiti is only about an hour or two long yet it is very treacherous as you climb more than 1000 feet in less than 2 hours on foot. As we were leaving the Dhankar Village behind I found this prayer wheel installed in a spring so. The loose pebbles and the crisp mountain air make you breathless within a few seconds. After breakfast, check out from the hotel in Kaza and head to Rampur Bushahr. It is approximately 280 kms away. Once you check in, visit the famous places to see in Rampur which includes the Raghunath Temple and Narasingh Temple. Built by Raja Jagat Singh, the Raghunath temple is dedicated to Lord Rama. It was during the 17th century when as an act of repentance for the loss caused to Brahmin, this temple was constructed. The temple was built in the traditional Pahari style and is one of the oldest temples in the valley. The Narasingh temple is about 1200 years old. It is dedicated to Vishnu. The presiding God of the temple is Narsimha, half-lion, the half-man and fourth incarnation of Vishnu. Later, return to the hotel for overnight stay. After an early breakfast, head to Narkanda. The distance is barely 65 kms. Once you check in at the hotel in Narkanda, head out to explore this beautiful hill station. First, visit the Hatu Peak. It is the highest point in Narkanda and gives an amazing scenic view of the hills that are covered in snow and its panoramic surroundings. The peak has two famous attractions in Narkanda, namely a small pond located on the top and the Hat temple. Some other attractions which you can witness on your way include the slopes of Jau Bagh and Dhumari. Later, return to the hotel for a delicious meal and relaxing sleep. Narasingh temple: Narsingh temple at 84 temple complex in Bharmour is devoted to lord Narasimha, an incarnation of lord Vishnu in which the god is represented in therianthropic form as half man and half lion. The idol of Narasimha is housed in nagara style temple of stone which is smaller in size than Manimahesh shiva temple and situated on the western side of compound above the decline of the hill. After sightseeing you will proceed towards Narkanda which Narkanda is a hill station with a beautiful view of Himalya ranges. This place is just like as heaven for nature lovers. Upon arrival check in to hotel and you may have lunch at same hotel. After lunch you will be taken towards some most visited places of Narkanda which includes Mahamaya temple, Stocks Farm, Hatu Peak and Thanedar Kothgarh belt. Mahamaya Temple: The one of the famous place of worship in Narkanda is Mahamaya Temple. This temple is dedicated to Godess Kali. Inside the royal palace built by King Sunder, its architectural style is similar to a fortress. Hatu Peak: the Hattu Peak is located at an approximate height of 3400 m from sea level. It has become a popular hiking destination among adventure freaks like bikers and trekkers. It is a major tourist attraction, as the peak offers an outstanding view of the dense forests and Himalayan ranges. After a scrumptious breakfast, you will see the other famous places in Narkanda today. First visit will be at the Tannu Jubbar Lake. This lake is an ideal picnic spot and is encircled with trees all around. We suggest to spend some relaxed time here while the mountains are watching over. Next, you can visit the Stokes farm. Sometime in history, cultivation of apples was brought to Narkanda by a man called Satyanand Stokes. This also got the town's economy to life. The area is known for enthralling apple orchards and a stroll through these is one of the most fascinating things to do when in Narkanda. Later visit the Mahamaya Temple. Located at distance of 7km form Narkanda town, the temple is dedicated to Goddess Kali. Set amidst breathtakingly alluring surroundings, the temple provides its visitors a sense of serenity and calmness. This place provides the perfect ambience for introspection and meditation. Skiing: Narkanda has a very famous skiing resort in Himachali Pradesh. HTPTDC also provides 7-day training to enthusiastic people seeking professional help with learning skiing. The season starts in December and ends in March. Tannu Jubbar Lake: This Lake encircled with trees all around is an ideal picnic spot and to spend some relaxed time with the mountain watching over. After treating yourself to some healthy breakfast, check out and drive to Shimla (65 kms). Once you arrive at the Queen of Hill Stations, check in at the hotel and move out to explore the must see places in Shimla post lunch. Take a walk along the mall road in Shimla. Shopping in Shimla revolves around The Mall Road, which is in the heart of the town. You can shop for shawls, local handicrafts, woollens, exquisite jewellery and a lot of unique artistic stuff. One of the most commercial and busiest areas of Shimla, this stretch in itself is a mini-world. Lose yourself here for a few hours and admire the rustic appeal and charisma of this place. There are a number of food joints too that run along this stretch. These famous cafés specialise not just in local delicacies, but also serve lip-smacking cuisines from other regions as well. Return for an overnight at the hotel. Shimla is hill station with a rich colonial history. One of most aesthetically planned Indian cities, Shimla’s cool atmosphere and the captivating natural beauty are bound to leave any traveller overwhelmed. Start your day with a toy train journey from Shimla to Kalka. It passes through beautiful valleys and hills and is one of the most wonderful train routes in the world. Next visit the Ridge. It is a wide open street that is set on the side of mall road. It is a market place and also the social hub of the town. The road is lined with bars, cafes, boutiques, restaurants and shops that attracts huge crowd each year. Later visit the Jakhoo temple. This temple houses the world's largest Lord Hanuman statue. Strain your neck a bit and admire its magnificence. Return back for an overnight stay at the hotel. Shimla church: Christ Church Shimla is the second oldest church in North India, after St John's Church in Meerut. It was consecrated on 10th January 1857 by Bishop Wilson of Calcutta. Built in Neo-Gothic style of architecture other impressive features of the Church include paintings that portray scenes from Jesus Christ’s life. As it is located at the most prominent road of Shimla, The Ridge, it has become an important landmark in the city. State Museum: The State Museum Shimla is housed in an old Victorian mansion carefully altered to adapt it to the museum. There are many colonial structures and heritage sites in Shimla that are of great historical importance. The museum also has a doll gallery which has several bride and groom dolls among many others which are admired by all visitors. Some archeological artifacts are also found here which include stone images from the 8th century. Chadwick Waterfalls: Chadwick Falls is located at about 7 kilometers from Shimla, just beyond the summer hill. The waterfalls cascades down in to a deep gorge, from a height of 67 meters. Chadwick Falls is best seen just after the monsoon. September would be the best time to see and enjoy the Chadwick waterfalls. By the evening you will be free to stroll in the famous shopping place of Shimla town, the Ridge. After that you will return back to hotel and overnight stay with dinner. After breakfast, head for a day excursion to Kufri today. If snow is what excites you, Kufri is quite a retreat if you're in Shimla. It is at a distance of just about 10 km from Shimla. The temples and panoramic views are absolutely worth your time. Visit the fun world at Kufri which is an absolute fun filled adventure, especially if you are travelling with kids. It is a must visit place in Kufri. It is one of the highest amusement parks and has the highest go kart track in the world. Next, take a horse ride up to the Mahasu Peak. It is the highest peak in Kufri and the muddy path is best traversed on horseback. No vehicles can ride up and the peak can be accessible only by mule or a horse which makes for an amusing experience. Kufri has a famous historic backdrop, for finished views and its ski slopes. Opt for skiing and let the adventure junkie in you have some fun. Yak rides are also an additional attraction. Later, return to the hotel to spend the night. The Himalayan Nature Park: The Himalayan National Park is one of the most renowned tourist attractions in Himachal Pradesh. It swanks 180 species of birds and uncommon mammals and hence this national park is a huge bio-diversity and eco tourism hub. Tourists can look forward to witness musk deer and the indefinable snow leopards. Skiing on the Slopes of Mahasu Peak: Kufri the winter sports capital of Shimla, leaves each and every visitor splendid with its beautiful white cover of snow. The slopes, the heights, and the snowy carpet it offers are the most adventurous platforms for skiing. The thick cover of snow is perfect for hosting the adventurous sport. Skiing, purchase one of the most popular winter sports has now become the signature sport of Himachal Pradesh during winters. Tourist from all over the country and ski loving international tourists converge on Himachal Pradesh during winters to enjoy the thrill and excitement of racing down the snow clad slope. Enjoy the last breakfast on this Shimla Kaza Spiti holiday tour and check out from the hotel. Drive to Chandigarh airport and take a flight back home carrying all experiences and memories you made on this amazing vacation. By Flight: The nearest airport to Shimla is situated at Jubbarhatti, 22 kms from Shimla has regular flights from Delhi but due to bad weather conditions, flights may be irregular. Alternatively better option is to reach Chandigarh Airport at a distance of 120 Kms away from Chandigarh, you can board Holiday Travel Taxi to reach Shimla in approx 2.5-3 hours. By Toy Train from Kalka: From Kalka, the Narrow-Gauge Kalka-Shimla Unesco - Heritage Toy Train connects to Shimla. The total distance covered is 96 kms from Kalka to Shimla with 107 Tunnels & 864 Bridges. The Shimla toy train starts Journey at 656 meters (2,152 ft) above sea level in Kalka and reaches Shimla at an altitude of 2,076 meters. The route offers a panoramic feast of the picturesque Himalayas from the Shivalik foot hills at Kalka to several important points such as Dharampur, Solan, Kandaghat, Taradevi, Barog, Salogra, summer hill and Shimla. The Railway has 919 curves, the sharpest being 48 degrees. The journey takes about five-and-a-half hours to reach Shimla. By Train: Indian Railways connects up-to Kalka (about 100kms from Shimla) by broad-gauge line. The Kalka station is connected to most major cities in India, including Delhi and Calcutta. Best time to visit Shimla in March to June, this is a popular tourist season in Shimla as the weather is quite pleasant and perfect for outdoor activities. The temperature is comfortable and usually varies between 15°C and 30°C. If you are into adventure sports then this is the ideal time to try paragliding, trekking, camping and rafting. Chitkul Village: The last village in India, beyond which lies the Indo-Tibetan Border, this one is about 28 km away from Sangla. Sitting on banks of River Bapsa, this village is mystery waiting to be unfolded. Sangla Meadow: The beautiful Sangla Meadows, also known as Sangla Kanda is another very popular sightseeing attraction nearby Sangla, which is known for its natural views and snow-covered mountain ranges. This place offers breathtaking views of Kinner Kailash mountain peak. This place will also provide a view of the local huts of Himachal along with the customs and lifestyle of its local people. Kamru Fort: Kamru Fort is one of the oldest Forts in Himachal. It is located in Kinnaur District of Himachal Pradesh. Distance of 2-km from Sangla, lies this wonderful place, the tower-like fort of Kamru. The Kamru Fort is a popular tourist attraction in the region, which is visited by a large number of tourists every day. Rampur's old religious shrines include the Raghunath temple, the Ayudhya temple, the Narasingh temple and Dumgir Bodh temple are the places of tourists’ interest. Also the Padam palace is one of the major attractions. Among other tourist destinations about 45 kilometers from Rampur, Sarahan is known for its ancient Bhima Kali temple. RAMPURTOWN (924m): There are many places for sight-seeing. It is old Hindu and Buddhist Shrines include the Ragunath Temple, the Ayodhya Temple, the Narsingh Temple and DumgirBudh Temple which has a large prayer wheel and hold important scriptures. In an interesting colonial and traditional styles, the Padam Palace is one of Rampur's major attractions. DUTT NAGAR (970m): 12 km ancient village on the left bank of Sutlej which derived its name from the ancient temple of god Daattatraya. Sangla Valley is located in the Kinnaur district of Himachal Pradesh. It is supposed to be one of the most beautiful valleys in the country. The villages in this place feature houses and temples that are built in Kinnauri wood and stone style. The serene Sangla valley is flanked by thick forests of Himalayan cedar and known as an abode to alder, spruce and the unusual birch. The place attracts every tourist with its beautiful temples, gompas, and friendly habitants. Chandigarh to jibhi is 268 km away from each other and it takes 7.5 Hours to reach by private vehicle. The small town of AUT can be reached after crossing a long tunnel on the highway. There is another route which is on the right just before the tunnel at AUT and one can take that road following the river and head further till Bajnar. Kacheri: This place is located 0.5 km from Oddi, and 7 km from Narkanda on NH - 22 and famous for ancient Mahamaya Temple. Kotgarh and Thandedhar: 17 km link road bifurcating from Narkanda takes you to the Himachal's Horticultural heartland, Kotgarh and Thanedhar, renown for apple orchards. The famous Stokes Farm is located at Thanedhar. Stokes came to India on a trip and while on a summer visit to Shimla, fell in love with its environments, which included the charming hill folk and settled down in Kotgarh. He started the apple farm which soon became renown with its Red Delicious, Golden Delicious and Royal Delicious, apples. Bhimkali Temple: This historical temple is a multistoried structured building, a fusion of Hindu and Buddhist architecture. The tall tower like structure and unusual roof of the temple dominate the complex. The centuries old temple is now locked and in the newly built temple, the goddess Bhimakali is portrayed as a maiden and as a woman. This temple complex includes other temples such as Narsingh shrine of Bhairon and Lord Raghunath. Bird Park: Near the temple complex is a pheasant breeding centre. It also houses the State bird Monal which is of a great attraction. Jalori pass has steepest drive which covers more than 2000 meters in 25 kms, it connects Shimla and Kullu valleys and offers fantastic views of the Dhauladhar and Kinnaur ranges. Spend half an hour at Jalori pass. The Most famous attraction of this place is Chaini fort trek and Sharingi Bagi temple. Chaini village is located in this town and which is inspired from Chinese art. There is well outlined and beautiful trail to reach temple. Chaini fort is another famous attraction, the rocks used in this fort are not easily found in this region. By Bus: As taxi at Jubbarhatti airport and Kalka station are not always agreeable for the long onward journey to Sangla, it’s best to head out in your own vehicle preferably one with a high clearance. Note that it is vital to break journey en route while driving from Delhi to Sangla. Travelling by a cab or car is ideal for families with senior citizens and kids or while in a group. By Train: The nearest Railway Station is Shimla Railway and is located at a distance of 194 Kms from Sangla. Shimla Railway Station is well connected with Kalka Railway Station and with the cities like Gumman, Kumarhatti, Sonwara, Barog, Kandaghat, Kathleeghat, Taradevi and Summer Hill etc. Sangla Valley is located in the Kinnaur district of Himachal Pradesh. It is supposed to be one of the most beautiful valleys in the country. The valley is set apart from others by its red apples orchard and luscious cherry trees. Baspa River also makes its way through the place, meandering and gurgling, famous for trout fishing. Sangla Meadows: Sangla Meadows also known as Sangla Kanda is another very popular sightseeing attraction nearby Sangla, which is known for its natural views and snow-covered mountain ranges. . Sangla Meadows additionally makes for a flawless site to see the Kinner Kailash mountain range with a 180 degree view. This place remains covered with lush greenery and is bounded by snow capped hills of the majestic Himalayas. Tibetan Wood Carving: The Tibetan Wood Carving Center is one of the most famous attractions of Sangla that offers amazing items made out of wood carvings in Tibetan style. You’ll come across beautiful chiseled woodcrafts that have been handcrafted to perfection. Kaja is the subdivisional headquarters of the remote Spiti Valley in the Lahaul and Spiti district of the state of Himachal Pradesh in the Western Himalayas of India. Kaza is known for its colorful festivals and the Sakya Tangyud Monastery. Rudyard Kipling described the Lahaul and Spiti region as ‘a world within a world’. And situated about 11,980 feet above sea level, it really is just that. Strung along the Spiti River, Kaza and the Spiti Valley have strong geographical and cultural similarities with Tibet and Ladakh. © Copyright 2019 - HolidayTravel India Pvt. Ltd.